We get a fair idea of how Malhar Rao Holkar, after the death of his only son during the siege of Kumher in 1754, trained Ahilya Bai in matters of State and governance. He kept Ahilya Bai informed about the political developments, such as his dealings with Najib–ud–daula and how Awadh was seeking his help, and about his own movements. After Panipat (1761) he was the only Maratha Sardar whose presence carried weight in the North. In another letter Malhar Rao asks her to have light guns and gun–balls manufactured. Father–in–law’s training was paternal but strict “… see that you reach Gwalior without halting for a moment at Mathura, though you wish to stop there.” In a letter of 16 March 1765, Malhar Rao wrote, “A messenger told us that you captured Gohadkars’ fort with a cannon : You should now stay at Gwalior and manufacture gun – balls the ruler of Gohad must, this year be crushed.” In two letter relating to officials who had ‘defaulted in’ their duty, Malhar Rao asks her to make them return what they had taken (misappropriated) or attach the parganah. 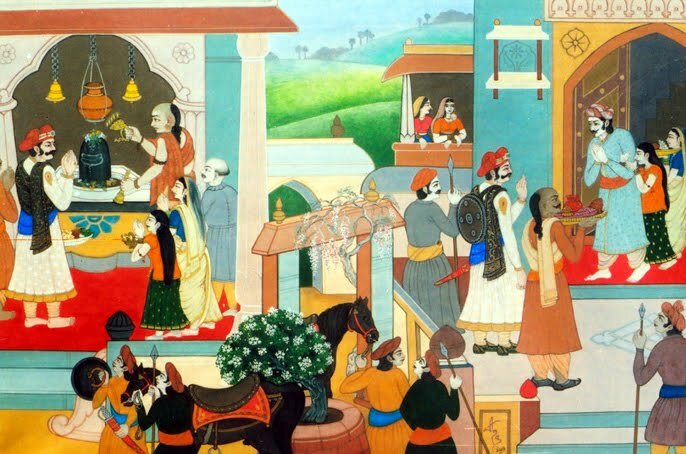 Malhar’s grand–son was young and the veteran of hundred battles knew that his daughter–in–law should be trained in all matters relating to wars as well as governance as best as possible. He advises her to fully weigh the strength and number of the enemy. “Do not rush head–long. Allow personality and prestige their own effect to work … never let the artillery be away from your sight. “Least power and greatest weight” should be your maxim and rule”. Ahilya Bai used this maxim and rule in a totally different field which not even Malhar could have ever thought of i.e. in building ghats, temples, rest houses and whenever required, she would write letters, such a to a Raja of Orissa, the Nawab of Kurnool, the Nizam of Hyderabad, the Nawab of Awadh, to the Rajput rulers politely conveying her desire to build a temple or a bathing ghat or to lay a garden near a temple at her own cost but quite often mere mention of her name sufficed and her officials and architects carried out, as directed by her, the construction works, keeping her in touch with the progress. 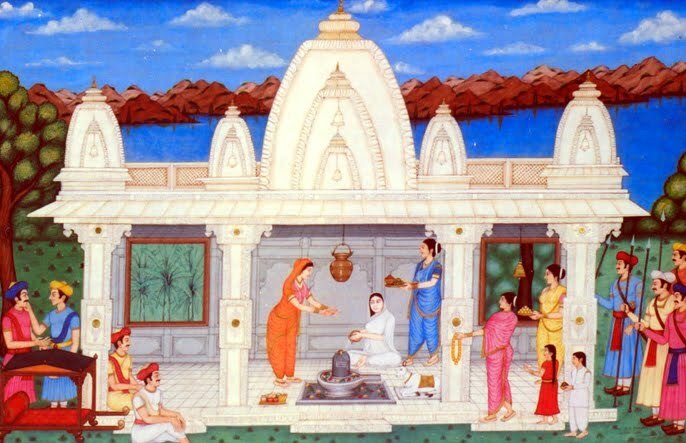 So many works were undertaken at her initiative that wherever one goes in India, specially to a holy place venerated by the Hindus, one find works of piety and charity attributed to Ahilya Bai. Devi Ahilya Bai’s concern for Maloji, the only surviving scion of Malhar Rao’s family was natural; she wanted him to be a worthy successor of his grand–father who had painstakingly built a large kingdom. In a letter she expresses her unhappiness for his silence over 2–3 letters sent to him. “Be writing to us and that too in detail. You must console yourself as directed in these letters … Direct your thoughts to the future management of the state as well as maintenance of your own status … Entertain broad views and management plans that elevate you even to a higher plane of fame than ever attained in the family … (4th June 1766). However, Maloji died in April 1767 after a brief reign of 8 months. Tukoji Holkar, who was not related to Malhar Rao’s family in anyway, was invested, with Ahilya Bai’s approval, with the power of Subedar on payment of Rs.16 lacs 62 thousand on the condition that he would serve the Peshwa in all his military campaigns. “Facts and courses of events, however, made Ahilya Bai the “De Facto Ruler” who received absolute obedience and respect from Tukoji to the commonest person. Ahilya Bai was gentle, fair minded and forthright in handling the affairs of the government. For instance when Tukoji submitted a bill of war–expenses to Devi, a bill which was not sanctioned by her, and even suggested to her that the Sardars should be asked to make–up for the bill, she wrote back that it would be unjust to ask the Sardars to pay as allotments to them were in proportion to the number of men engaged in service and not a jot more, and the Sardars were present serving in the field. “Hence it is not justified under the circumstances to ask them to pay,” she wrote. Tukoji, who held the supreme command of the Holkar troops, in another letter says that nothing great has been achieved since his arrival in the Deccan and asks for money as the Peshwa desired him to undertake a big campaign. Ahilya Bai replied, “From where the money will come? You say that the receipts from the Swadesh territory (Sourthern) have already been paid to Poona treasury. … You were on the spot and nothing has been achieved. “This is not fair.” Reminding Tukoji about her father–in–law’s principle to rectify a wrong without waiting for aid or orders, whatever might be its nature, she pulls up Tukoji for his delayed planning. “The schemes of campaign are being planned (by you) when the clouds have already appeared in the sky! How can artillery and other war material reach you in the rains?” Her tone is never angry or abusive but calm and always supported by weightily reasons. It was the purity of her heart, honesty of purpose, desire to be just and fair at all costs towards all, her devout nature, pure life and her spiritual strength which made others listen to her with reverence and obey her. She was very solicitous about the rights of her subjects of whichever rank they might be. She turns down the advice to raise 10% tax from the Mahals of the Sardars saying, “Thy can’t pay beyond their means.” When a Sardar interfered in the matters and rights of a Pargana officials and all the Patils, Mamlatdars, Fadnis, Mazumdar, Jamadar came to her with complaint of injustice, she writes to the noble in question, “Dear Tulsaji Waugh – after giving a free audience to all a memoranda for future working of the Parganah is being sent to you … You should not, henceforth no wise, interfere with affairs of Mamlat of the Pargana … Please consult the officials first.” Her object was to work for the welfare of all, high or low and “under her wise head and strong hand”, the state witnessed unparalled peace and prosperity. Devi Ahilya Bai was a devotee of Shiva, but, like any other Hindu, held other gods also in great reverence. About 8 of the 12 Jyotirlingas of Shiva, namely at Somnath, Mallikarjuna (Distt. Karnool), Shri Omkareshwar (M.P. ), Shri Vaijnath (Nizam’s deminion), Shri Nagnath (Nizam’s state), Kashivishwanath, Sri Trimbakeshwar (Nasik district) and Shri Ghirishneshwar (Verul, Nizam’s state) there is clear mention in the Holkar State Records of her ‘charities’ and construction works. Thus at Shri Somnath is Kathiavad, she “re–installed the idol” in a magnificient temple in 1789. Her building works and charities at Varanasi include installation of Kashi Vishwanath in a temple built by her near the place where Aurangzeb had destroyed the earlier one, 6 private temples, Ganga mandir (temple of the Ganges), 3 temples on the Ghat, Mankarnika Ghat, Dashasvamed Ghat, Female Mankarnika Ghat, a few Dharmashalas, establishment of Brahmapuri for learned Brahman scholars etc. She sent from Maheshwar an idol of Shri Ramchandras Panchayatan for installation at Banaras (and one at Chitrakuta also). We have another list of constructions and charities by Ahilya Bai at Saptapuris or seven sacred towns viz. 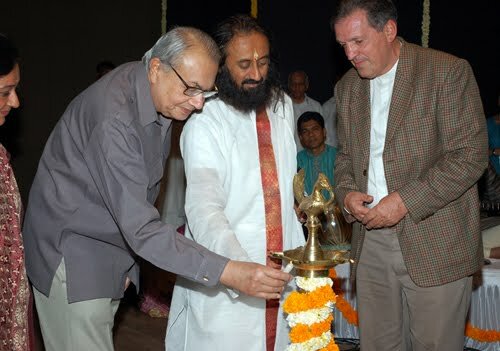 Ayodhya, Mathura–Vrindavan, Maya (Haridwar), Kashi, Kanchi, Avantika and Dwarka revered by all the Hindus. Thus she built at Ayodhya temples dedicated to Shri Ram, Treta, Bahirava, and Nageshwar and the Saryu Ghat, besides dharmashalas where pilgrims could stay either free or by paying a nominal sum. Writes Thakur “The Kshitras (Holy spots) and Tirthas are the various stations on the road of the progressive Hindu religion and the Devi has, so to say, sustained and strengthened these stations with her chartieis for good.” She herself used to go on pilgrimages such as to Omkareshwara, Mankeshwara etc. During her reign annual revenue of the state, which was Rs.75 lakhs in Malhar Rao’s time, rose to Rs.1 crore 5 lac. Her reign was marked by peace and plenty, absence of famine, social harmony and a contented populace and officials, both Saranjami Sardars as well as the heriditary servants. The Saranjami Sardars, who were bound to maintain the prescribed number of cavalry, formed the “Huzrut” or the standing army. Tukoji, the Subhedar, who represented the military aspect of Devi Ahilya Bai’s administration, ever remained most respectful and loyal towards her. In a letter he expresses his sincere regret for going astray and requests that he and his entire family should live under Devi Ahilya Bai’s orders. In another letter, he requests the Devi to bring his son to senses. When Ahilya Bai was deeply upset on her daughter Mukta Bai becoming a sati in 1791, Tukoji Holkar made an earnest appeal to her, “Until I come there, please do not think of going anywhere out; if you do, I again swear by the feet of the late revered Subehdar (Malhar Rao), and on my life.” She organised a good postal system and all soldiers and subjects had faith that in case of their death in field or unprovoked violence, their family will be taken case of by the Devi. She was conscious of the threat from the English who were trying their best to spread their control in all quarters. 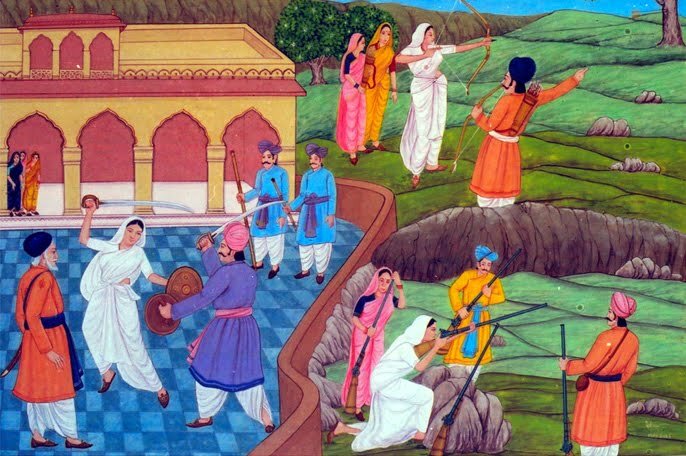 In a letter she says, “It behoves the Peshwa to enlist good number of Silehdars and increase the standing army and Nawab, Bhonsle and the rest should make a common cause and crush the English.” But then direction of military operations was in the hands of the Peshwa and Tukoji Holkar had to carry out Pune’s directions. If the latter lacked good sense, planning or misplaced assertion, as in Rajputana, the blame goes to the Peshwa and not to Ahilya Bai. Ahilya Bai’s rule is known for peace and tranquility and for “trophies of peace and not war” in that turbulent period where everywhere there were wars, political instability, sieges and conflicts. The only strife and struggle during 30 years long reign of Ahilya Bai was the Rampura affair but which brought to light both her diplomacy and statesmanship. As V.V. Thakur writes, “Peace was her policy in the main, when opposed she first tried re-conciliation. When that failed, recourse to arms was the next but necessary step. Stronger measures foreign to her nature when necessiated, and she faltered not. But at last all was forgotten and forgiven. An opportunity for repentance and reform was offered and the whole affair ended in “Justice mingled with mercy.” There and many instances which support this assessment of the great lady who was venerated as a most pious and saintly, a mother like figure during her very life time. In that period of instability and turbulence Ahilya Bai had “one of the most stable reign of the 18th Century so much so that her territories in Malwa were never attacked or disrupted by local battles during her reign inspite of wars all around.” All through her reign, her relations with the foreign princes remained most amicable and cordial. The comfort, happiness and peace enjoyed by her subjects, in whose prosperity she felt a peculiar solace and sense of fulfillment, during her 30 years of rule were unprecedented in the annals of Malwa. The accounts of the State were kept with scrupulous exactness under her care and no decision was taken by any of her ministers, and even by Tukoji Holkar, without her knowledge and advice, such as employment of a French Officer named Chevalier Dudrenec who trained four battalions of her army, or policy to act in concert with Mahadji Sindhia in resisting the march of the English troops in Gujarat in 1780. The envoys residing at the courts of the Indian potentates were all appointed by her. 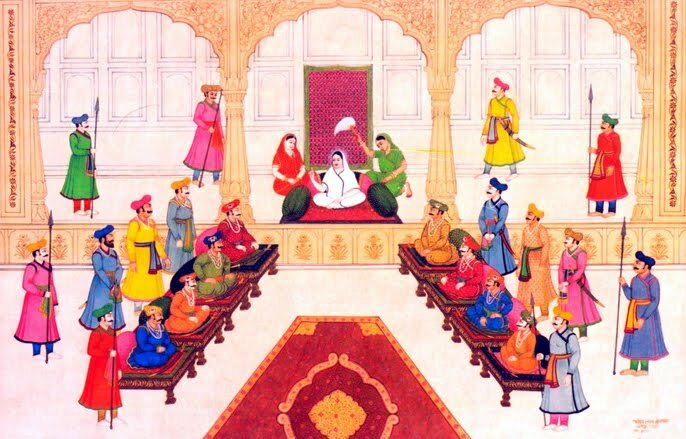 During her long rule in Malwa, Ahilyabai received “that allegiance and respect from feudatories and sovereigns, which might well excite the envy of any prince or princess in any part of the country”. Though an extremely pious lady, who devoted much of her time in offering prayers and in meditation, she was always ready to attend to any task which required her tact and skill. “She always evinced a maternal regard for the welfare of her subjects and under her they were so happy and contented that no Indian Sovereign in any age could boast of a more contented raiyat”. In fact she rejoiced when she saw her people – nobles, bankers, merchants, farmers–rise to affluence, without herself ever experiencing the slightest tinge of cupidity. Among her many accomplishments was the development of Indore from a small village to prosperous city, though her own capital was nearby Maheshwar on the banks of the Narmada river from where she not only conducted the administration but also provided ample patronage to arts and letters. 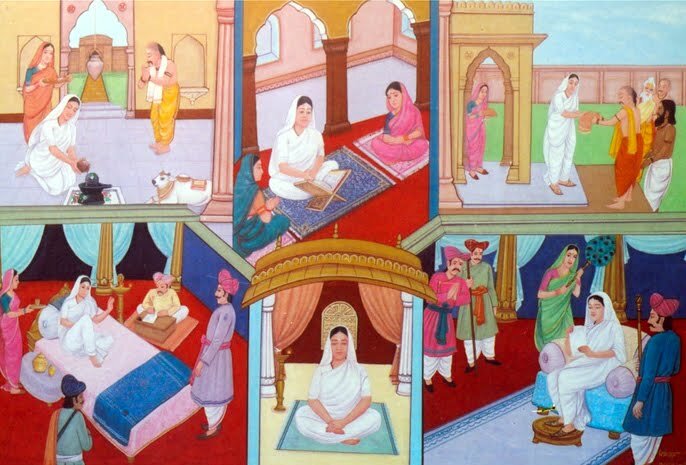 From 1766 till her death in 1795, Ahilya Bai ruled Malwa with such ability that her thirty year long rule is regarded as a “model of benevolent and effective government.” Under her maternal care the state prospered and the people grew happy. With her subjects her name is sainted and she is styled as avatar (incarnation of divinity). Indeed she was a Raj Yogin in the truest sense of the term, as Burway says.